Dual energy X-ray absorptiometry (DXA) is the gold standard for osteoporosis screening in postmenopausal women, particularly those aged 65 and older. But it’s not just for women, as older men deal with the same issues concerning bone density and have an even greater risk of mortality after a hip fracture. In addition, DXA may be used as a body mass measurement tool for evaluating lean and fat mass. Sports medicine practitioners also are seeing the benefits of this technology in determining peak performance and training regimens. Finally, software additions to DXA allow imaging of the thoracic and lumbar spine to detect the presence of vertebral fractures. Vertebral fracture assessment (VFA) may be of even greater value than DXA in determining future fracture risk. However, an increase in the number of DXA applications doesn’t necessarily mean there’s easy access to bone mineral density testing. Clinicians who can afford to offer the test are more likely to control where and when DXA is used today. As with several imaging specialties, a decline in reimbursement in the private practice setting is influencing decisions regarding where patients can go for scans, even though DXA is not considered an advanced imaging modality like MRI and CT. 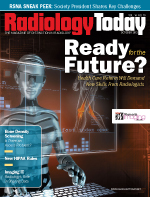 Private practitioners such as OB/GYNs, rheumatologists, and endocrinologists who offered DXA scans in their offices, as well as smaller women’s imaging centers, are eliminating this service, creating a shift from point-of-service care to hospitals and larger radiology centers as the primary locations for bone density testing. According to Andrew Laster, MD, FACR, CCD, an International Society for Clinical Densitometry (ISCD) past president and a rheumatologist in Charlotte, North Carolina, whose practice has included DXA scans since 1986, 70% of all DXA scans were performed in clinicians’ offices in 2002, with the remaining percentage picked up by hospitals. He says those numbers are shifting away from private practices and toward hospitals. According to information provided by the ISCD, Congress first cut DXA payments in 2007, along with Medicare payments for other imaging services, as part of the Deficit Reduction Act of 2005. Further cuts, phased in over time, occurred when the Centers for Medicare & Medicaid Services reduced payments for work done by physicians in the course of interpreting DXA scan results. Under the Affordable Care Act, DXA payments were restored to 70% of the 2006 level, bringing reimbursement back up to nearly $100. But that increase lasted for only two years. In the end, a provision to increase Medicare payments for DXA was not included in legislation enacted this past January. Standards for DXA testing were enacted by Congress in 1997 as the Bone Mass Measurement Act and codified by the CMS. They allow for DXA testing for individuals who are estrogen deficient, individuals with a vertebral abnormality such as osteopenia or fracture, individuals on steroids with prednisone equivalent of 7.5 mg/day for three or more months, individuals with hyperparathyroidism, and as a monitoring response to FDA-approved drug therapy. The ISCD also sets standards for when DXA should be used. Indications for bone mineral density testing call for DXA scans for women aged 65 and older and for postmenopausal women younger than the age of 65 who have the following risk factors for low bone mass: low body weight, prior fracture, high-risk medication use, and a preexisting disease or condition associated with bone loss. In addition, women who are in the process of menopausal transition and have clinical risk factors for fracture should undergo regular DXA scans. Women discontinuing estrogen also should be considered for bone density testing, according to the indications listed above. Determining bone density baseline numbers is the principle use of DXA, says Bradford Richmond, MD, FACR, CCD, a radiologist with the Cleveland Clinic in Cleveland, Ohio. Educating the patient as to the importance of determining bone health is important since many patients do not understand why they should undergo the first scan. Like high blood pressure, if the silent symptoms are not found, the consequences—stroke for high blood pressure and fracture for low bone density—are the first signs of the diagnosis. Once a fracture occurs the risk of subsequent fracture significantly increases and compounds with each additional fracture. Additionally, DXA scan protocols don’t provide specifics regarding when follow-up testing should be done, Richmond says. This is a concern, particularly when it comes to patients following an osteoporosis medication regimen. In some cases, follow-up is required because of the protocol related to a particular medication. As practices either eliminate DXA scans from their service set or reduce the number of locations where it is offered, patient access to DXA becomes limited. Even though DXA is part of the standard “welcome to Medicare” exam, Laster, who also is the chair of the ISCD’s public policy committee, says fewer patients are undergoing the test, primarily because of access issues. He notes a 12.6% decrease from 2008 to 2011 in nonfacility offices providing DXA scans, with a total 8% decrease in scans only partially offset by the increase in DXA testing in the hospital. The declines in the practice setting are larger—30% to 60% in more rural states, he says. “Despite the public education regarding osteoporosis, we’re not getting to all the people who need DXA scans,” he says. Patients with multiple issues (eg, diabetes, heart disease, osteoporosis) can fall into a dangerous situation if all aspects of their health are not considered, according to Singer. “In cases where a patient is dealing with several medical issues, the question is how can we make sure osteoporosis makes it to the list of conditions to be treated and followed up. Patients with chronic medical conditions have limited time with doctors who are handling their osteoporosis treatment as well. While often their other medical issues require immediate attention, it shouldn’t come at the expense of fracture prevention,” Singer says. Removing the DXA scan from the specialist’s office also can cause a delay in patients receiving test results, Richmond adds. In many instances, Laster says, the addition of VFA assessment to DXA will enhance fracture risk prediction and improve patient care. Many vertebral fractures cause no pain or are not imaged since back pain is so common. In many individuals with osteopenia or low bone mass, unless you were aware that they had a prior facture, their calculated fracture risk would be low enough to not warrant drug therapy. — Kathy Hardy is freelance writer and editor based in Phoenixville, Pennsylvania. She writes primarily about women’s imaging topics for Radiology Today.